Arcadia Valley is located 80 miles south of St. Louis and two hours from Cape Girardeau. Nestled among the highest mountains of the Missouri Ozarks, the Historic Arcadia Valley is embedded with rushing mountain streams and is home to the cities of Arcadia, Ironton and Pilot Knob, all founded in the 1800s. 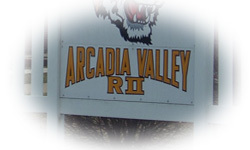 Arcadia Valley R-II, with current Principal Lance Sprenkel, is located in Ironton, and hosts 400 students. Mr. Don Barzowski’s Civic Class worked on the YEA project focusing on how smokers justify their smoking spending even at the expense of others. They independently shot four Public Service Announcements (PSA’s) and showed all the announcements with various non smoking themes to the whole student body at a talent and variety show. Mr. Barzowski, also presented the professionally developed “what’s your secret” to their Board of Education who gave tremendous support for their work in the project.